The Four Townes Rotary RiverFest is an annual event put on by the Rotary Volunteers of Deland, DeBary, Orange City, and Enterprise, Florida. The monies raised at this event helps to sponsor their many on-going charity projects throughout the year. This charming country festival, held at the picturesque Gemini Springs Park, is full of heart and country soul. Two stages spread out in this sprawling park setting, offered two distinctly different kinds of entertainment for the festival attendees. The first stage offered local country, folk, and bluegrass bands, which was happy, and festive, with a country hometown feel. The second stage, a community stage, offered ethnic spanish dancers, bellydancers, and also two very polished, and talented boy bands, which drew screams from their adoring teenage audience! The famous Rotary Catfish Dinners were there again, which included coleslaw, and baked beans, boy it sure looked Good! There were lots of interesting activities going on. The CERT team, was conducting a rescue drill on the grassy lawn, and were demonstrating how they approached and helped persons with broken bones, and other various maladies. It was very interesting to watch! There was a Volusia County Helicopter, and they were allowing kids to get inside and see what it was like inside the cabin, and pretend to steer it! There was a kiddie ride section that included a bouncy house, a bouncy obstacle course, and a jumping beans harness jumping thing, that the kids really loved! Unlimited wristbands, for use of all attractions could be purchased for a very reasonable price. 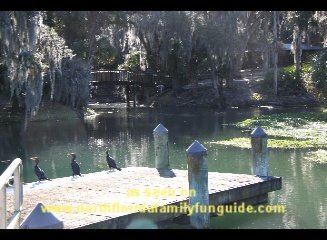 There were people walking around the park, enjoying the beautiful vistas, birdwatching, boating, and fishing. In the following video presentation, the kids in the boat had caught 5 or 6 very large Tilapia. The fishermen on the dock caught another Tilapia as we were watching. It was very interesting! This festival had such charm and heart, full of volunteers with the heart to help people, and it really showed. We had a very nice time, and hope you will check it out next year in MARCH. Thank you to The Jackson Creek String Band for the use of two of their original songs for the background music. Thank you to the Four Townes Rotary for all your hard work and dedication to helping others!